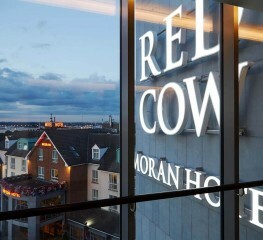 The Red Cow Moran Hotel in West Dublin is one of Dublin’s largest conference venues (up to 800 delegates) and probably the best-known conference, meeting and event venue in Ireland. Everybody knows where it is and how to get here. Having the perfect location on the Naas Road by the famous Red Cow Roundabout at the junction of the M50 and the N7 makes it one of the most convenient conference venues for people coming from just about anywhere in Ireland, including Dublin Airport. The appropriately-named Red Cow Luas tram stop is just across the road and that will take you to Heuston Station, Connolly Station and Dublin City centre. The Red Cow Moran Hotel can cater for a wide array of meetings and events, including board meetings, training sessions, seminars, workshops, conventions, conferences, exhibitions and gala banquets. When it comes to Dublin Conference Venues the Red Cow Moran Hotel stands out from the crowd as one of THE best-known, best-located and best-facilitated conference and banqueting hotels in Dublin. Catering for conferences of all sizes for over two decades the Red Cow Moran Hotel really understands what it takes to make an event like this a success. Flexibility is key! Our team treat each incoming conference as unique and work closely with organisers to help tailor the individual requirements of each event. We understand that when it comes to conferences, delegates today, have very high expectations and organisers need to keep reinventing their events to keep them fresh and attractive. It is essential that organisers choose a conference venue that allows them the flexibility to ensure that the delegates experience extends beyond the event itself. The Red Cow Moran Hotel offers extensive conference facilities in a choice of 21 event spaces. The largest conference space available is the ‘Ballroom’ which is 556 square metres and can cater for up to 800 delegates theatre style or 500 guests for a banquet. This ballroom which consists of the Merrion, O’Connell, Pearse and Parnell Suites combined, offers a flexible space to suit a range of conference styles and set ups. Sound proofed partition walls allow the ballroom to be broken up into smaller spaces ideal for break outs, workshops, exhibitions, seminars, training and even private dining. We also have 14 dedicated meeting and events spaces in the West Wing. 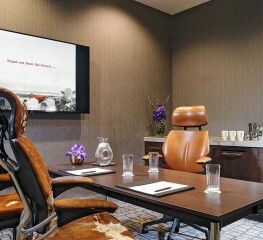 All the conference spaces at the Red Cow Moran Hotel are air conditioned and fully equipped with the essentials required to host a professional conference from high-speed broadband to state of the art audio visual equipment. The Red Cow Moran Hotel is an accessible venue choice for a Dublin Conference. For delegates travelling from all corners of the City and Country and beyond, this 4 star Dublin Conference Venue is conveniently located just off the M50 at the gateway to the Provinces and only a short drive from Dublin International Airport. Add to this, 315 luxurious bedrooms, 4 bespoke long term apartments, choice of bars and restaurants and extensive onsite car parking and the Red Cow Moran Hotel ticks all the boxes for the perfect Dublin Conference Venue. On behalf of the Institute of Technology Sligo's exams office I would like to thank you and your staff most sincerely for your efficient, courteous service. This service enables us run our off site examinations with confidence that the venue and staff therein will accommodate all our needs. The invigilating staff who stay with you are most impressed with your service. We look forward to working with you again in May. I just had to email you to thank you and every one of your team for all of your assistance at our IAUN conference last week. From the very start I have found you to be really professional, friendly and so accommodating to all of our needs. Organising such an event can be stressful but you certainly helped to ease that stress. On the day every one of your team were friendly and courteous and the feedback from one and all was fantastic. Ireland T&T Ltd has been helding our training courses in Red Cow Moran Hotel on a weekly basis for the past 6 years. The Red Cor Moran Hotel is an excellent choice for anybody considering hosting their events there. Top level facilities and excellent staff make for a brilliant environment within which to operate. The communication with the reservation staff is always prompt and attentive. Everything is well organized, the meeting rooms are up to the hight standard we are always extremely happy with the meeting. Great deal on a parking fee for our clients. Refreshments are delicious. The hotel is one of the best in Dublin. I recommend Red Cow Moran Hotel to anybody enquiring. As an organisation which provides a national service we seek locations that are easily accessible for conference events. 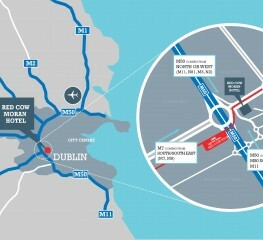 For our recent events over 7 days in May and June, the proximity to the N7 and M50, with plenty parking available and the Luas (city tram access) a 5 minute walk away made the Red Cow Moran Hotel an ideal location.